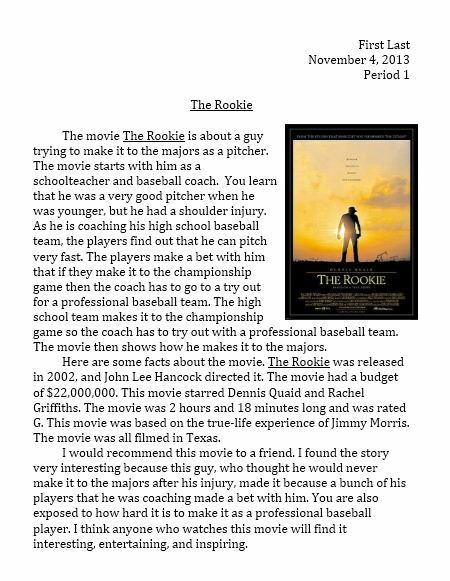 You are to produce a report using Microsoft Word about a movie. Please pick a movie that you have seen and can find information at (click here) IMDB.com or (click here) for Wikipedia. After you pick a movie from this web site, read about it and focus on some facts about the movie that deals with facts about the production and the business aspect of the movie. Use the paragraph guide below for the structure of the report. Please use your own words when writing about information from the web site. Please use the font of Cambria and the size of 16. Paragraph #1 - This paragraph is to be a general summary of the story of the movie. Paragraph #2 - This paragraph should give some facts about the production and financial aspects of the movie. When was this movie released? Who were main cast of the movie? How much did the movie gross? What was an interesting fact of the movie? Paragraph #3 - This paragraph is to be a review of the movie. Would you recommend this movie? What are the best qualities of this movie? Who would like this kind of movie?